Known for her virtuoso performances from Houston’s Mucky Duck to Carnegie Hall, Loreta Kovacic is recognized both as a pianist and a singer-songwriter. She calls herself a three for one special: pianist, singer-songwriter and a storyteller. Her original album "Brother Tadpole classics" was nominated for a Grammy in 2011. She started out as a classical pianist in her home country of Croatia. After immigrating to Texas and graduating with a Doctorate degree in Music from Rice, she continued her work as a performer and a teacher, later adding an original children's theatre, the "Alchemist Piano Theatre". "Her show has a distinctively cabaret feel to it, with all the notes filtered .through her larger then life personality" (Culturemap, Houston 2010). “She moves from classical to jazz and pop genres as fluidly as her fingers dance around the ivories (Houston Press)”. “Genuine artistry at the keyboard” (Vecernji List, Croatia). Loreta performs with her theremin player Joe Parani. Dr. Loreta Kovacic, who is fondly referred to as the “Alchemist”, is an accomplished musician, teacher, author and children’s theater director. Her spirit is what makes her a true alchemist in that she has the uncanny ability to transform the seemingly normal into true gold. This ability is reflected in the children she works with, inspiring a new level of confidence through music and performance! 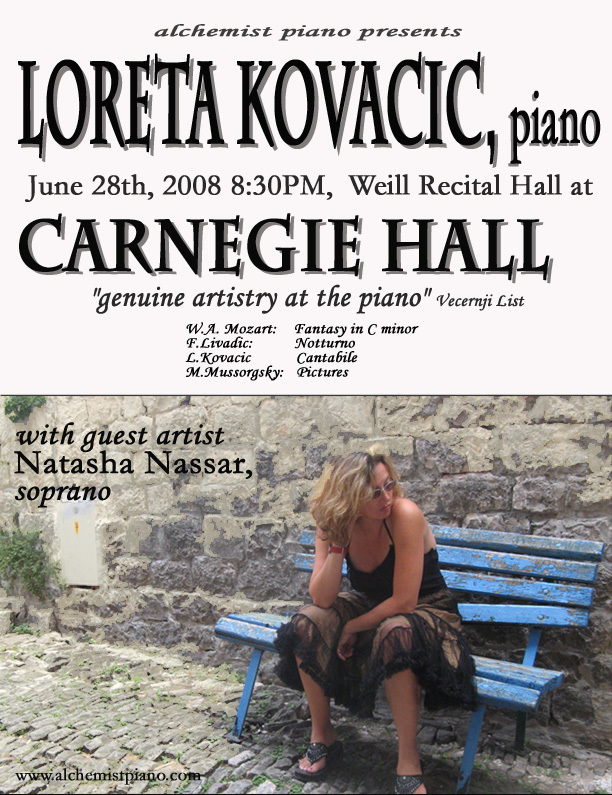 Loreta holds a Doctorate in piano performance from Rice University, but is widely known for her performances from small local stages to Carnegie Hall. Her critically acclaimed work, Brother Tadpole Classics, garnered her a Grammy nomination. When she’s not performing she plays, composes, teaches, directs and creates music at her piano studio in the Houston Heights. Loreta is an internationally acclaimed classical pianist, composer and Carnegie Hall soloist, graduated from Zagreb Music Conservatory in her native Croatia. Although awarded a full piano scholarship to Julliard, Loreta chose instead to make her home in Houston, Texas, where she graduated with a Doctorate in Musical from Rice University. Long before settling in Houston, however, Loreta began a career as a teenage rock star in her native Croatia. While performing as a classical pianist, she also earned a reputation as her country’s first electronic female keyboard player. Loreta is now well known as an entertainer and a teacher in Houston Heights. She is the artistic director of the Alchemist Piano Theatre, original musical theatre for young audiences. As a singer-songwriter, Loreta can be found performing anywhere from Mucky Duck, MFA and Discovery Green in Houston to Mardi Gras Museum in New Orleans and Carnegie Hall in New York. She loves performing and recording in her native Croatia with her brother, cellist Stanislav Kovacic and her dedicated Theremin player and artistic collaborator, Joe Parani. She has performed live in “Good Morning Croatia” and many Radio and TV shows in Croatia and in the USA. She welcomed Croatian president to Houston and she opened for Croatian singer-songwriter Oliver Dragojevic in Houston in 2015. Although elementary school-age children in particular thrill to her popular APT productions, all ages enjoy and appreciate Loreta’s sophisticated music. KUHF radio compares her original music to that of Eric Satie, but she calls her own style “Slavic & Western”, and herself a “Texas Slav”. Some of her songs are witty and entertaining, while others dwell on the darker more Slavic sounds from her past. “She moves from classical to pop and jazz genres as fluidly as her fingers dance around the ivories” (Houston Press). Many of her songs are inspired by music from around the world; a unique, international mixture of influences ranging from Jamaican to Bosnian, Arabic influenced rhythms. “I find inspiration in the world around me, from family and friends to the incredibly rich music from around the world. I love to listen to the underlining voices of the amazing places in countries that I travel to. Music and art are among the best things our world has to offer. “Sejla” was written in Sarajevo, Bosnia, “Iguana” in St. Thomas, Virgin Islands, “Evil Jelly Fish” was inspired by a friend, “Space Bunnies” was inspired by my 5 year old daughter’s drawings, etc.